We love slab pies over here...a pie baked in a bar pan. What we don't eat fresh from the oven, is stacked in layers with parchment paper in between and frozen to be used as needed (a few pieces at a time). A container of slab pie (apple, berry or peach) is always a staple when we leave on a road trip with the RV. 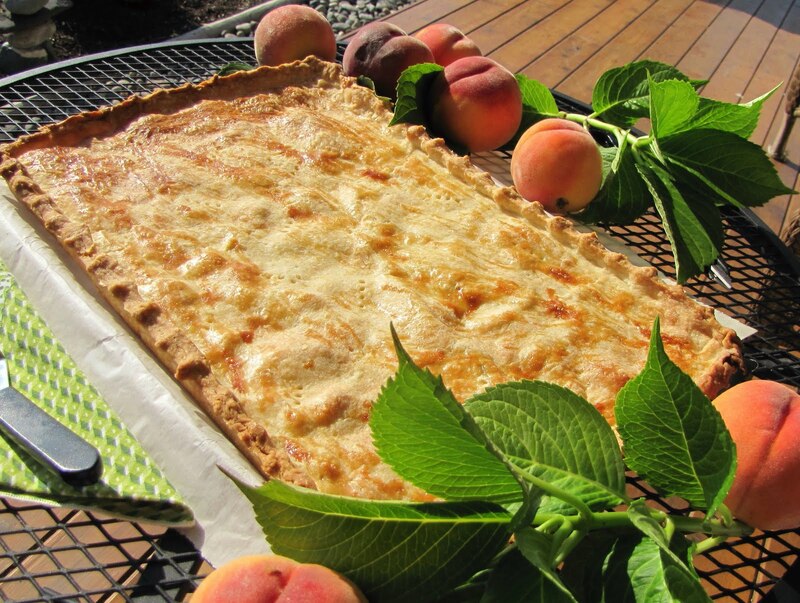 Since the peaches are at their juiciest best over here, we have been enjoying them fresh and in desserts. There's a peach slab pie in the freezer ready for the taking, one piece at a time! 6 cups peaches (about 9-10), peeled, pitted and cut into thin slices. Combine flour and salt. Cut in margarine to obtain coarse crumbs. Mix egg yolk mixture into flour mixture until dough holds together in a ball. Roll out half the dough on floured work surface....slightly larger than 12 x 16 inches. Spray 12 x 16 inch pan with cooking spray. Line with parchment paper, leaving a 1-inch overhang on the long sides. Transfer dough to prepared pan. Trim edges of dough...leaving 1/2 inch to hang over edge. For filling, combine sugar, cornstarch and salt. Add sliced peaches and lemon juice and stir. Pour peach filling into prepared baking sheet. Roll out remaining dough. Place on top of filling. Trim edges of dough to hang over sides slightly. Fold edges under and pinch to seal. Beat egg white until foamy and brush over top crust. Bake at 375°F for about 45-50 minutes...or until golden and filling is bubbling. Allow to cool completely on wire rack (several hours). Then pull up parchment paper to remove. Cut into 20 pieces. Freezes wonderfully. * This pastry recipe will be more than enough for a 12 x 18 pan (Pampered Chef bar pan). Use any leftover pieces to make a galette or two. My mom just told me about your blog...and what a gorgeous blog it is! I'm so happy to have found it. This pie looks divine. I'll have to go out and get myself a bar pan and bake one of these this Fall. Thanks for the fantastic recipes! Bought some peaches that are just a tiny bit mealy. Was going to process them into a jam, but now I think I'll make a slab pie!! Have everything on hand - woohoo! Thanks!! This looks beautiful! Perfect dessert to take out of the freezer...one piece at a time:). This looks like a great pie for a crowd. The freezing idea is good, too! I'm not sure I have the right pan for this, though. :( How deep is this pan? Thanks! Is this what Russian Mennonites used to call "platz"? I love this idea. There are so many ways to use it! Thank you for sharing. Your website should carry a warning that it could be seriously detrimental to one's waistline!! 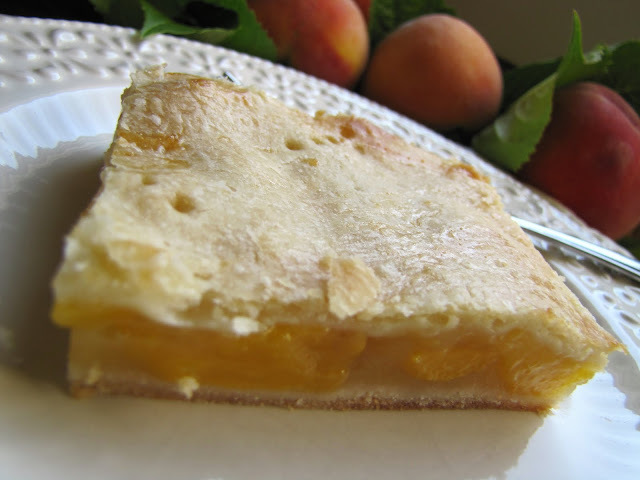 Peach slab pie is my idea of heaven! AH!! Thank YOU!! I wish your blog came with "Scratch'n Sniff" pictures!! I have to try this recipe!! XXOO, Damaris PS. Thank you for always sharing your recipes with us, you are such a blessing!! I am known around here for my pies (a family tradition), but I am always wondering if there is a slightly better recipe out there. I love to try new ones. 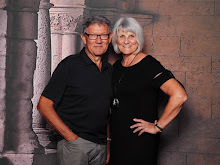 So...... this week we were invited to our very good friends home for supper. I decided to bring 3 mini peach pies (each a slightly different recipe) and 3 mini rhubarb pies (each a different recipe). We had a "taste -test". There were 8 people trying them. The filling recipe for your "peach slab pie" overwhelmingly won for the "best peach pie". My original rhubarb pie won the "best rhubarb" category. So, congratulations, Judy!! You are truly the peach pie princess! I've added this to my menu! I'll be cooking for a cowboy crew in a few weeks when we ship here on the ranch and this looks like it fits the bill perfectly! Thank you! I just made this as a trial run on a smaller scale before our Easter Dinner. Since I have zero access to fresh peaches in rural Saskatchewan, I used my canned peaches from last summer. It is FABULOUS!!! I can't wait to make this in a huge pan for my extended family. Thank you for such a wonderful recipe! Hey Judy - I'm going to make this for our family picnic this weekend. Hope mine turns out as good as your's looks :). Have a great weekend! Hi Judy, I wonder if anyone has put a crumb topping on this beautiful pie? I have never tried it with a crumb topping...but why not? If you give it a try, let us know how it turned out. Wow! This pie is fantastic! The first time I made it, I followed the recipe using nectarines in place of peaches (was what I had on hand). Today, I made it again only I used canned apples from the pantry and the recipe for apple pie I normally use and the crust from the slab pie (doubled the filling). I can't believe anything I've made tastes this good. Thank you soooo much for a great go to pie recipe, that's actually easy to make. I will be making it again! The family loved this! It disappeared quickly. We are considering it for our daughter's outdoor wedding in the summer. Hi nice blog you have. Do you perhaps have a recipe for a Milk tart to serve 50 people? If anyone can help, I will appreciate. Peppermint tart and Milk tart recipe for a crowd anyone?